Hi, I have to forms on my site and not receiving submissions from either of the. I have tried a live account and gmail. Help please. Click on the border for the form in question and click 'Settings'. 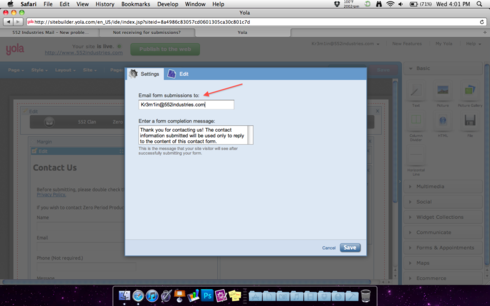 Is the email shown the email you would like for form submissions to be sent to? Received email from support and they tested the form... Seems to be a bug so now using the widget. I have tested this and it does appear that form submissions are not being received. For the time being I would suggest using the Wufoo Form for the time being. We will certainly keep you updated when our engineers have had time to look into this. Thanks! I am happy to confirm that I did receive the submissions I tested - it just took a bit longer then normal. This being said, I no longer thing this is a bug. Please re-check your Spam/Junk folders and give it some time. (It took approx. 3-4 hrs for me to receive my test). We would appreciate you touching base with us tomorrow in this regard. Hi, they came threw in to my inbox, but i have done the Wufoo forms now so will be leaving as is as it takes me forever to do this web site stuff lol. We're just glad to see you have a way to use a form on your site, whether it be Wufoo or Yola's!